Are you looking for sign mounts that will enhance business décor while perfectly positioning custom directionals for clients? How about a standoffs signage anchor that doesn't require you to drill through your panels? 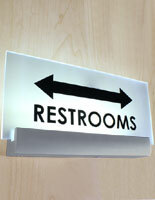 The sign rails featured in this line are among the more user-friendly models we have in stock. The clean and simple modern design still supports larger acrylic boards. Each of these sign mounts with rail grip holds the base of a panel a good distance away from the wall, providing a 3-D view of directional messaging that visitor’s won’t overlook! Some of these brackets position the display at a true perpendicular angle, extending it a full 90° angle from wall or ceiling. This perpendicular clamp for directionals is popular in corporate buildings across the country. This commercial mounting hardware is best used where messages are updated often, such as a company office suites. Swapping out custom panels is so easy and fast. 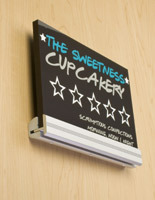 Retail stores benefit from fast-change sign mounts they can update quickly when new merchandise hits the market. Banks can easily respond to the whims of the market with fresh messaging using these sign rails. What are some of the distinguishing features of these signage standoffs with perpendicular grips? 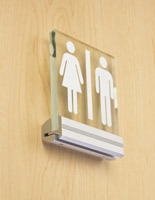 These sign mounts are constructed from extruded aluminum, with satin silver anodized coating. 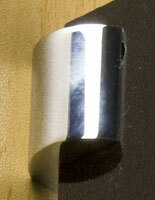 Brass grips are finished in chrome or satin silver. 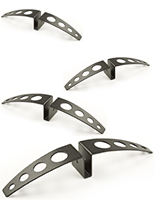 Brackets are sized 2", 4", 8", 12", and 16", and “male” and “female” supports hold panels in them securely. Each rail style messaging tool can support a panel between 1/8" and ½" thick. Perpendicular holders support signs that are 3/8" thick. Grips hold your sign panel at a 90° angle, while mounts hold the boards parallel to the wall with a 9/16" space in between. This mounting hardware for signage standoffs is an easy and secure way to make directions visible to customers entering an office building or public venue for the first time. 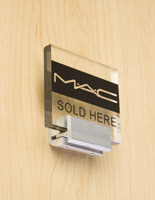 The hardware holds one or two mounts constructed of acrylic, metal, wood, or plastic; or assemble a bunch of brackets together to create a series of wayfinding sign holders. To install, first, anchor the "female" style bracket to the wall using the included screws and a separate drill. Then, sandwich your solid sign board between the "male" and "female" bracers. Finally, tighten the set screws below the sign panel. Install panels the way you normally would. Or, create acrylic shelving with these sign supplies by flipping the wall mount in a horizontal direction instead of a vertical one. This perpendicular grip kit ships with the necessary spacers, screws, anchors, and an Allen wrench. Please note: The panel itself is not provided with this wholesale rails kit, but it is easily located and for sale elsewhere on this website. 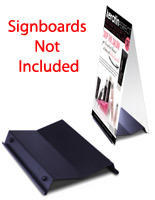 As always, cost needs to be taken into consideration when purchasing quality message holders. Luckily, these perpendicular rails are incredibly affordable. 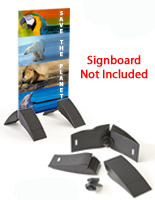 Most of the custom standoffs in this category are under $20, allowing the user to modernize signage inexpensively. 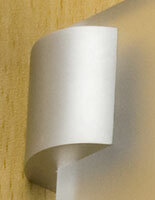 Purchase this mounting hardware at wholesale prices when you order in bulk! This line is great for designers who want to carry a contemporary look throughout an office or building. Browse this sign holders collection with a variety of plated finishes and easy-to-install mounting hardware.